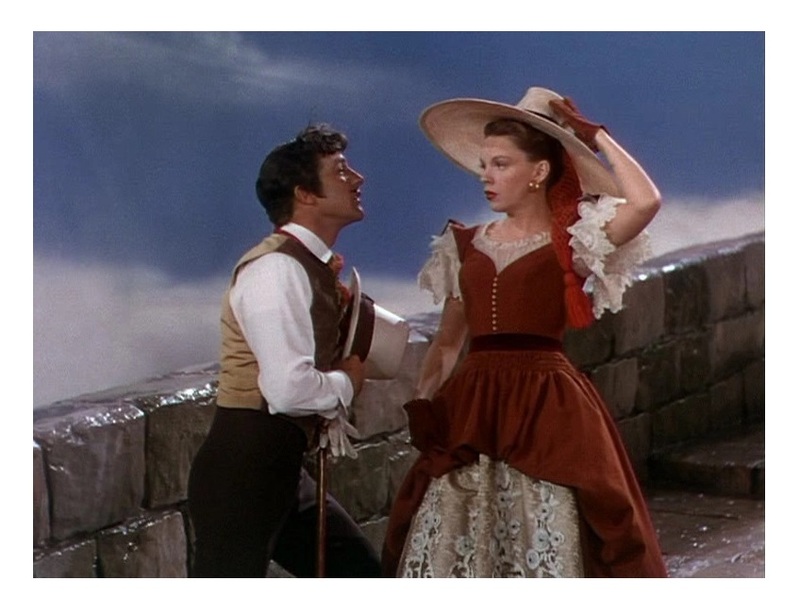 In a remote small Caribbean village, Manuela (Judy Garland, The Wizard of Oz) prepares to marry the town’s mayor, Don Pedro (Walter Slezak, Sinbad The Sailor). She, however, dreams of having an exciting life with the legendary pirate, Mack “the Black” Macoco. When a travelling actor, Serafin (Gene Kelly, Singin’ in the Rain), finds out about Manuela’s obsession with Macoco, he pretends to be the pirate in order to impress her. The plan, of course, backfires on him. 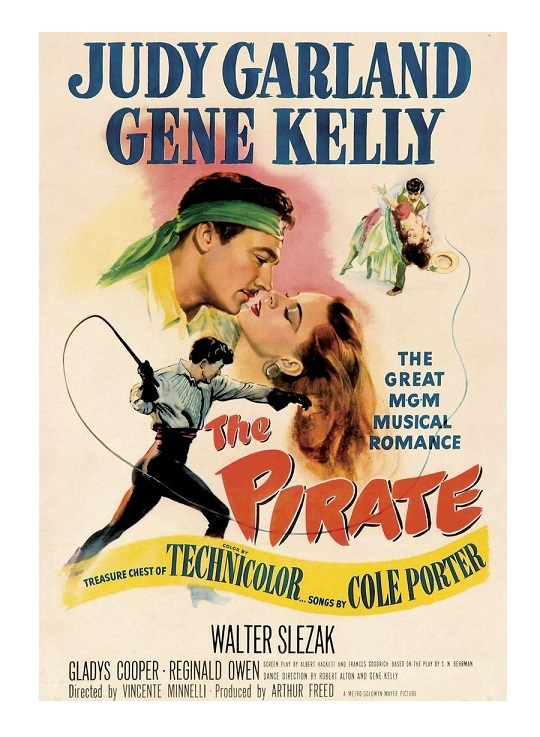 The Pirate is one of MGM’s less celebrated musicals. It seems that you either love it or hate it. I tried to re-watch it with that in mind, and I still don’t understand what’s not to like about the production. It’s possible that some viewers find the film’s artificiality hard to digest. Anyhow, I loved The Pirate even more the second time around. The film has an interesting background story. Composer Cole Porter (Anything Goes, Kiss Me, Kate, etc.) was hired by producer Arthur Freed (An American in Paris) to write songs for a non-musical play by S. N. Behrman, which had been a big Broadway hit. Porter wrote the songs specifically for Gene Kelly and Judy Garland. The Pirate was directed by Garland’s then husband Vincente Minnelli (Gigi). Legendary art-director Cedric Gibbons (My Fair Lady) created the fantastic sets. Harry Stradling (Auntie Mame) shot the film in gorgeous Technicolor. All that talent and postwar audiences stayed away. Even today there are plenty of naysayers. I simply don’t get it. My only complaint is that it doesn’t have enough musical numbers. I counted only five — Irving Berlin’s Easter Parade (1948), Garland’s second musical of the year, has fourteen songs! — so there are big stretches with no music. Kelly really stepped up his game with a series of dance numbers that varied in style, but are consistently amazing. I think he’s able to covey the idea that you can be both masculine and graceful. His “Niña” is just sublime; a smooth, but energetic dance routine. 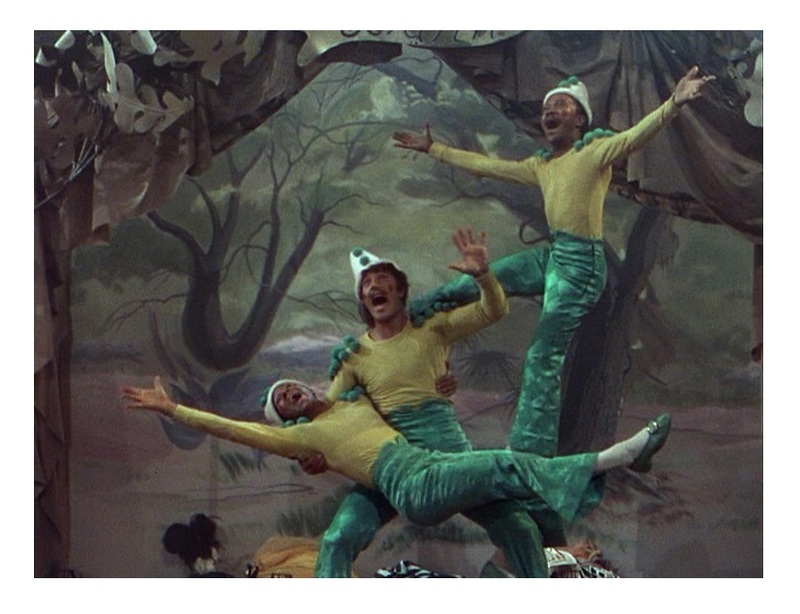 He also has a striking dreaming sequence — a Minnelli trademark — full of ballet and acrobatics. It’s also a musical number that suggests deep psychological ideas. But I think, “Be a Clown,” with the Nicholas Brothers, is still one of best things Kelly ever did. The song was later transformed into “Make ‘Em Laugh” (Singin’ in a Rain) (Porter, allegedly, didn’t mind the plagiarism). I also liked how Walter Slezak plays the heavy as if he was in a serious drama — he’s a superb villain. Gladys Cooper (Now, Voyager and The Song of Bernadette) plays Garland’s silly, but well-intentioned aunt. The cast also includes George Zucco (The Mad Ghoul), Reginald Owen (Mrs. Miniver), and Lester Allen (The Dark Mirror). From start to finish The Pirate is a lot of fun. It compares favorably with the greatest movie musicals — it’s clearly the best of the three musicals Garland and Kelly made together (For Me and My Gal and Summer Stock are the other two). Color, 102 minutes, Not Rated. If you need any suggestions, I would be glad to give some. For instance, since you wrote about a horror film for our blogathon and seem to be a fan of them, perhaps you would like to write about “The Phantom of the Opera” from 1943, since it featured Nelson Eddy. Thank you for responding! I understand about being busy. Speaking of upcoming blogathons, I announced an idea I have for one in June at the end of the roster for the “Singing Sweethearts Blogathon:” https://pureentertainmentpreservationsociety.wordpress.com/2018/02/12/ring-the-assembly-bell-the-singing-sweethearts-blogathon-has-arrived/. Right now, I’m just trying to see if anyone is interested in participating. If I get a positive response, I’ll make the official announcement. If you think you might want to participate, leave a comment and say so!